How Far Apart to Plant Tomatoes – It is a vegetable that is always consumed and needed in every human food today. A plant called “Solanum lycopersicumL” is among the most widely consumed in the world and is always needed in most modern recipes. Its popularity is increasingly in demand when it is associated with benefits for human health. Why do tomatoes need to be planted in your garden? Because tomatoes contain many nutrients such as vitamins A and C. In addition, tomatoes are lycopene-rich vegetables that are needed for body health. One of the things that farmers need to pay attention to is “how far to grow tomatoes” to produce high-quality tomatoes. If planted properly, tomatoes will provide quality results and provide benefits for you. Among the important things that affect tomato quality are the state of soil fertility, temperature or weather, and plant spacing. So, how far apart to plant tomatoes so the results are abundant and have high quality. You want to grow tomatoes and want to know how long to grow tomatoes from one another. Here are five factors that influence the distance of tomatoes planting. Why is it important to note? Similar to other plants, the spacing determines the future yield. 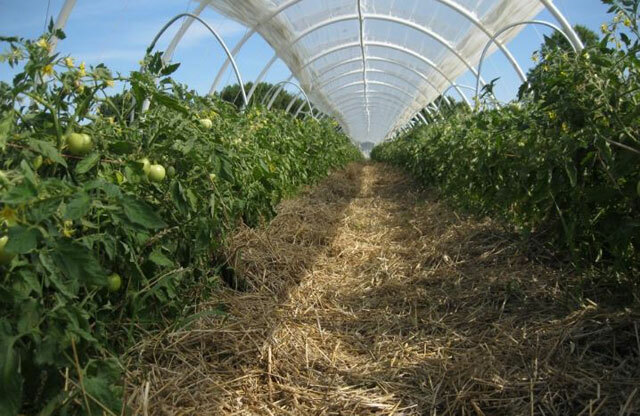 So, the tomato spacing is very important to know so that the growth of tomatoes is good and give a lot of production. Tomato plant density is one way to maximize space in your garden. With the right density, you can plant more plants with good growth. Besides that, pay attention to sunlight, tomatoes really need adequate sunshine. However, we must also note that the density of the spacing that is too tight can have a detrimental effect on plants. This is caused by the competition of sunlight, water, and nutrients in the soil and certainly affects the yield. So, the conclusion is that plant density is not always best for tomato plants. How far apart to plant tomatoes is relative to the variant and soil fertility. Here are some factors that influence tomato spacing. The space needed by plants is a major consideration in growing tomatoes. Tomato root will need a lot of space in your garden so that high density can have a bad effect on growth. Planting distance for big tomato varieties is certainly farther away, this tomato plant has a root system that is much deeper up to 3 feet. This root system can reach up to 10 feet from the main stem. It is can give you an idea of how far space you have to grow tomatoes in your garden. So, the recommended tomato spacing is not less than 3×5 feet. If it is tighter than this, then tomato production will decrease due to lack of sunlight, and nutrients from the soil. Furthermore, tomato varieties also determine plant spacing. Do you plant indeterminate, determinate or dwarf varieties. If you plant indeterminate varieties, you can make a spacing of 2 feet between plants. Staked indeterminate varieties can grow and develop with one leg between each plant. However, the recommended distance for indeterminate tomatoes is about 3 feet between plants. The eterminate variety when compared to indeterminate varieties, it can develop with a closer spacing. You can make a closer spacing, this is 2 feet between the consecutive plant and 3 feet between the row of plants. While the dwarf variety is the most suitable type for planting in pots. But it can also be planted on the ground. For above-ground planting, you only need to make a spacing of about 1 foot. So, growing tomatoes and other plants has its own distance. Among the misconceptions among many farmers today is that a tight spacing can produce a larger harvest. In fact, plants will reduce production if the spacing is not correct. If you plant indeterminate varieties, you can make a spacing of 2 feet between plants. Staked indeterminate varieties can grow and develop with one foot between each plant. However, the recommended distance for indeterminate tomatoes is about 3 feet between plants. The determinate variety when compared to indeterminate varieties, it can develop with a closer spacing. You can make a closer spacing, this is 2 feet between the consecutive plant and 3 feet between the row of plants. So, growing tomatoes and other plants have its own distance. Among the misconceptions among many farmers today is that a tight spacing can produce a larger harvest. In fact, plants will reduce production if the spacing is not correct. Furthermore, which affects tomato spacing is soil conditions. Moisture, nutrition, is very important for plants. You can make a closer spacing if your soil is loose clay. In addition, the pH of the soil also greatly affects the yield. 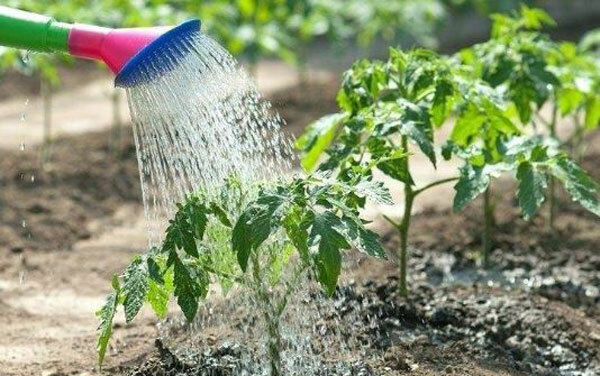 Tomatoes are good to plant in soil with a pH of 6.0 – 6.5. Maybe, some farmers plant tomatoes at different distances. But one thing you have to pay attention to is to provide enough space for plants. Based on the explanation above, you must understand the needs of plants, so the planting should not be too close or too far. Tomatoes are plants that grow quickly and require a lot of water and nutrients. For optimal growth, tomatoes also need to get full sunlight. If the spacing is too close, it will compete against sunlight so that it is not good for growth. If there is not enough sunshine, the tomato growth is disturbed, it will grow small twigs and stunted leaves. All of this will affect the production of your garden.